Along the Caribbean coast of Nicaragua, the country's largest terrestrial mammal still fulfills its role as "gardener of the forest." Baird's tapirs are shy, rarely seen mammals that reach 400-600 pounds as adults and eat more than 100 different species of leaves, stems, seeds, fruits, and bark. Tapirs—known commonly in Nicaragua as "dantos" in Spanish, "pamka" in Mayangna, "tilba" in Miskito and "mountain cows" in Creole—landscape the forests by munching on vegetation and dispersing seeds as the plod along. Over the centuries, tapirs have played an important role in shaping the lowland tropical rainforests along Nicaragua's Caribbean coast. Still, until a few years ago, very little was known about Nicaragua's tapir population, other than the fact the animal has become a highly endangered species due to poaching and deforestation. Of the some 5,500 tapirs left in Mesoamerica, only 500 are thought to be living in Nicaragua—down from 2,000 several years back, according to local estimates. At the current rate of extirpation, conservationists estimate that Nicaragua's tapir could become extinct within 20-30 years if action is not taken immediately. To reverse the trend before it's too late, the Nicaragua Tapir Project is launching an ambitious conservation campaign to protect the animal, education the population and build the country's first tapir rescue center. But first conservationists needed to collect some scientific data to learn more about the animal's range in Nicaragua. Over the past three years, motion-sensor camera traps have revealed that Nicaragua's Caribbean coast is one of the largest remaining hotspots for tapir habitat in all of Mesoamerica. 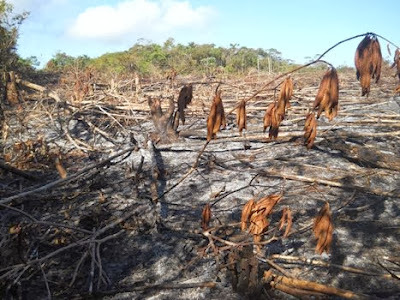 Until recently, the country was home to a genetic corridor between the Bosawás Biosphere Reserve in the north and the Indio-Maíz Biosphere Reserve in the south, providing a globally significant segment of the species' range. Tapirs have a very slow reproductive cycle, with a gestation period of approximately 400 days. After that, a mother will give birth to a single tapir calf, which won't reach sexual maturity for another 2-4 years. That makes tapirs highly vulnerable to anthropogenic threats that increase their mortality and create obstacles to reproduction. The tapir project also endeavors to build the country's first tapir rescue, rehabilitation, and re-introduction center in the Wawashang Reserve. Territorial governments have been strong partners in these efforts, including the Awaltara Territorial Government, which officially banned tapir hunting within its territory in early 2013. 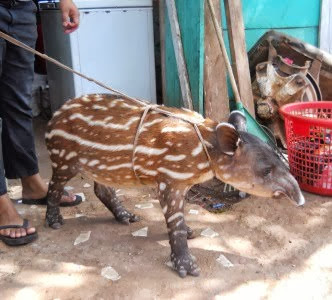 The Nicaraguan Army's Ecological Battalion is also committed, and assists in rescuing tapirs that have been captured in the jungle for the illegal pet trade. For more information and Nicaraguan Baird's tapir videos please watch the following clip on Youtube and read "Baird's tapirs in Nicaragua." Please help tapirs in Nicaragua by donating to a crowdfunding campaign to build the country's first Tapir Rescue Center. Tapirs losing habitat and they're still hunted!